Note: Scheduled outages start when a unit's reported output drops below 100% and ends when it returns to 100%. Like most electric generators, nuclear reactor operators typically schedule maintenance in the spring and the fall to help ensure that the reactors are available to meet peak electric demand in the summer and winter. (See previous electricity maintenance story.) Although a reactor can hold several years of fuel, operators choose to refuel their reactors after approximately 18 or 24 months of full power operation. The chart shows total daily nuclear unit outages since 2007 based on data available from the U.S. Nuclear Regulatory Commission (NRC). 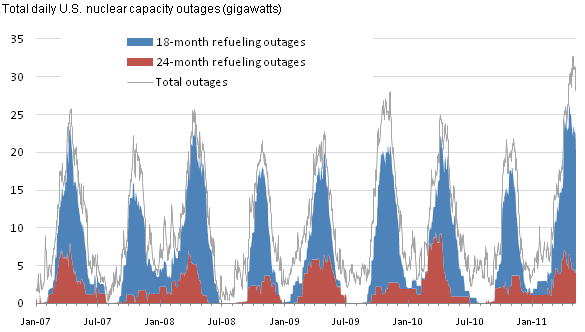 Total refueling outages show seasonal peaks ranging between 15 and 20 gigawatts relative to the 101 gigawatts of total U.S nuclear summer capability. Non-refueling outages included other planned maintenance outages and forced outages. The industry marked a ten-year high in total outages at the end of April 2011 with the loss of Tennessee Valley Authority's three Browns Ferry units (almost 3.5 gigawatts) due to tornado damage to transmission lines serving the plant. This comes on top of a fairly active refueling outage season. A reactor can be refueled in as little as 10 days. However, when a unit goes down for refueling, the outage lasts an average of about two months. Reactor operators typically defer much of their non-critical maintenance work until a refueling outage. They conduct this maintenance work in parallel with the refueling. By minimizing the number of times that the reactor powers down, operators maximize their reactor's online time and profitability even though it extends the refueling outage. The NRC data yield an annual average capacity factor for the U.S. nuclear industry from 2007 to 2010 of about 90%.